If you have taken a dog or a cat on an RV trip in the past, you know it is no easy feat. Travel can put many animals in a natural state of anxiety. For travelers who have a new pet, think hard about whether or not you should take them. If RVing is a regular occurrence, it is probably a good idea. Otherwise, the kennel or a pet sitter might be a better option for more sporadic travelers. It is best to start traveling with pets early in their lives, so they can learn and become comfortable with you RV travel conditions. However, make sure the to let kittens and puppies grow to an appropriate age first (around a year is usually a safe bet). So, to establish the best travel routine for your pet, we have included some advice to be a responsible pet owner. This first step is the most important. Many dogs and cats are not used to nausea and stress brought on by extended travel. As such, it is crucial to creating a safe space when transporting pets. Before going on the trip, it is essential to know your pet’s personality. Easily startled dogs and cats may need time to get used to the loud engine. Incredibly active dogs and cats will have a particularly hard time adapting to the confined spaces of an RV. Other pets will have no trouble at all adjusting, it all depends on the type of animal you have. Luckily, this behavior can be unlearned. Show your pet around the vehicle while the RV is stationary. When they exhibit signs of stress (panting, barking, meowing, whining) feed them treats. This reward practice will help the pets associate the RV with the pleasure of eating a gift. This training can potentially take a long time, so do not get discouraged. You should introduce driving in a similar, slow manner. Take the RV for a spin around the block with your pet and see how it reacts. If it responds poorly, it will need time to get used to the movement of the vehicle. Crate training is a significant advantage in this situation. While crates might seem confining and cruel, that are a source of great comfort for dogs and cats. Pets crave safe, enclosed spaces — especially when they are under stress. If after a year your dog still has trouble being in the RV without help, you may need to seek additional training from a professional or consider leaving them behind during vacations. Unfortunately, many RV parks and campsites have strict pet fees or restrictions. Accordingly, it is prudent to plan and locate pet-friendly lodging locations. Keep in mind; these pet restrictions often apply to hiking trails as well. It is also useful to check the weather in the weeks before the trip, especially if your dog is scared of rain or thunderstorms. One lousy weather night can put a lot of stress on you and the pet. Gather up food, treats, toys, leashes and other equipment your cat or dog will need. If you buy a specific brand of dog food, try to stock up, since remote park general stores likely will not have a wide selection. Make sure your pet has an up-to-date name tag. A tracking chip is also a good idea, primarily if your animal has run away in the past. In case of a medical emergency, try to keep a first aid kit for your pet. In a pinch, it can mean the difference between life or death. 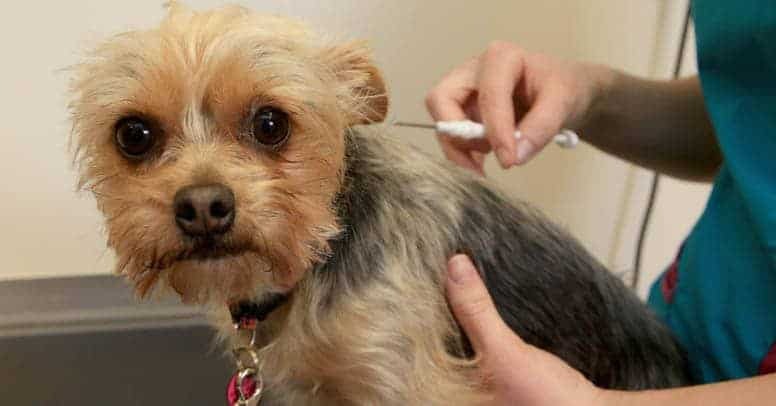 Benadryl (for allergic reactions to animal bites. Whether at a campsite, park, trail or rest stop, you should up always clean up after your dog or cat. While pet-friendly areas are becoming more popular, they can quickly be taken away because of one careless owner. No one likes having their trip ruined by stepping on pet poop, so leave everything exactly the way you found it. Due to the close quarters and limited storage of RVs, leftover food can often be left out on the counter or other places within reach of pets. The short tables are accessible for almost any dog to jump up on. Excess human food can upset a dog or cat’s digestive system and make them sick. Remove the temptation by always putting away food after eating it. Try to never leave your pet alone with idle food. Create a comforting routine for your dog or cat, by adhering to day to day activities. Take your pet on a walk once or twice a day around the same time. Serve meals at the same time each morning. Play with your dog regularly. Having a consistent structure of fun activities will keep the pet happy and comfortable. Well-adjusted, pets make the best RV traveling companions. Since they brighten our days so much, it is essential to take precautions when taking them on trips. As we said, dogs and cats come with all different types of personalities. Some of these personalities are inherently not compatible with long-term travel. 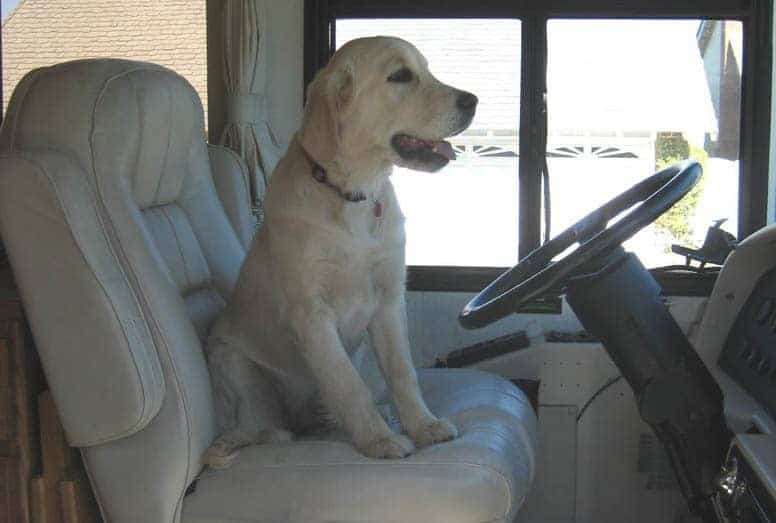 But with training and long-term planning, RV travel with pets can be both safe and fun.